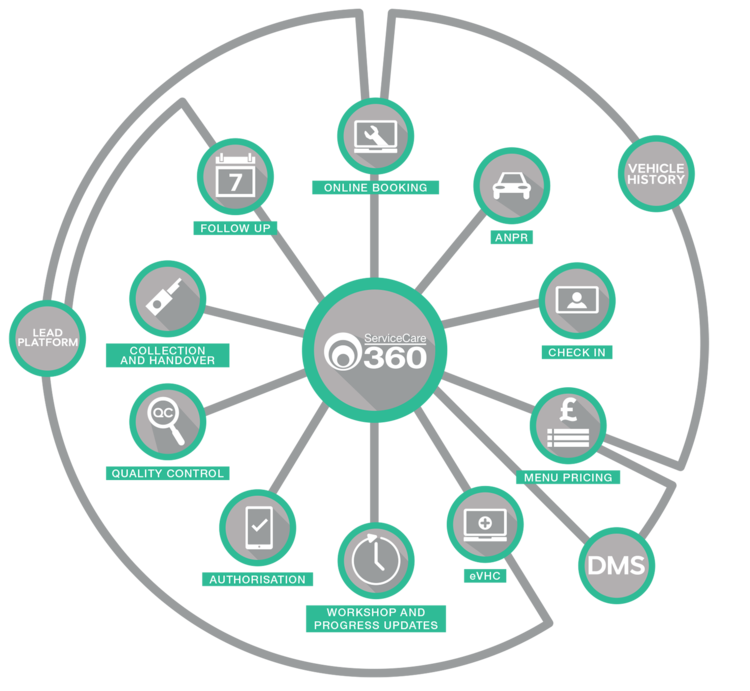 ServiceCare 360 is here to make it easier than ever for you to access, control and use the customer information that flows through your business – helping enhance productivity and the ability to measure success. ServiceCare 360 fits easily into your existing working processes, with no disruption, saving you time not costing you time. Designed to provide effective results minimizing re-keying, optimizing performance and business-building opportunities whilst providing even more benefits. ✓ The customer enters a vehicle registration, details of their vehicle are listed. ✓ They select a preferred dealer, date/time and the work required. ✓ Progress and notifications populate across screens in the customer lounge, service reception, workshop control and technician kiosks. ✓ A tablet based interactive check-in welcomes the customer and can start the eVHC process. ✓ Any clearly visible work can be priced instantly and stock availability checked. ✓ Customer authorization can be immediately obtained and orders placed. ✓ The menu pricing system details up to 100,000 jobs & models up to 15 years old. ✓ Offering transparency to the customer; quotes are generated in under 10 seconds. ✓ Integrated with the control system, menu pricing and lead management platforms. ✓ The vehicle health check completed via tablet captures images and video whilst displaying pricing and stock information. ✓ The integration with lead platforms drives customer authorization. ✓ Through touchscreen technology, scheduled jobs display all information, help with the allocation of correctly trained technicians and track productivity. ✓ The system allows users to send an SMS containing video and images to a customer, displaying identified work on a vehicle, enabling them to authorise, decline or request a call back live on the system. ✓ Vehicles scheduled to be checked are displayed by registration number on the workshop control screen. Clear reports are provided, helping to identify trends that need to be addressed, improving customer experience and ‘fixed right first time’ results. ✓ The customer experience survey is designed for use at the dealership kiosk by tablet making it easy to ask customers a few questions about their visit. Any low scoring interview is communicated to the service manager instantly.